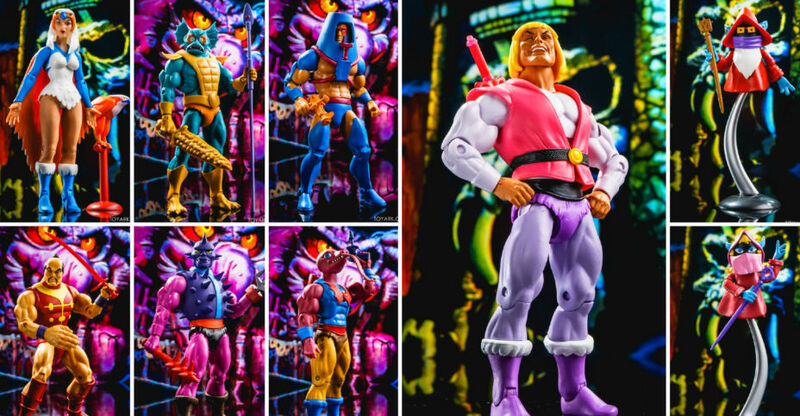 Masters of the Universe Classics Club Grayskull Mega Gallery – Wave 3, Powercon and Laughing Prince Adam! Time for a mega gallery update for Masters of the Universe! I’ve been grabbing Club Grayskull, the cartoon themed toys of the characters, since it first launched. I missed the early stuff of standard MOTUC and never fully jumped in. Club Grayskull gave me a chance to get a good rep of classic He-Man stuff on the shelf anew. Soon after, Mattel shut down Matty Collector but luckily the awesome folks at Super7 have picked up where they left off. We are now on Wave 3 of the line featuring Sorceress, Man-E-Faces, Mer-Man and Tung Lashor, with Wave 4 announced. Today we are looking at Wave 3 along with several exclusives that fit in the Grayskull theme. Power Con held their annual event over the summer and had three exclusives – Spikor, Chopper and a 2 pack of Dree Elle and Uncle Montork. Super 7 also dropped a Laughing Price Adam during SDCC, and web orders for that are just coming in now. We’ve got all 8 releases here and we’ve done up a mega gallery featuring them all. We also ran the previous figures with similar fancy backgrounds so the whole line is available in a uniform style. Read on to check over 150 images of them all! 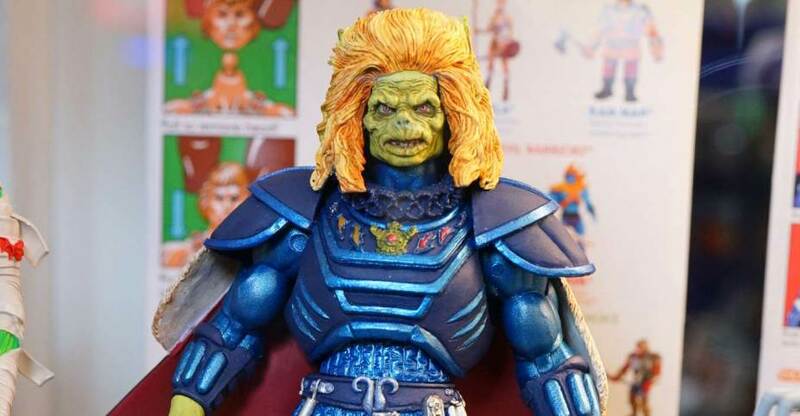 ICYMI – Check out our previous Masters of the Universe Classics Club Grayskull Galleries! Pre-orders for the Masters of the Universe Club Grayskull Wave 2 and Masters of the Universe Classics Wave 2 end on Thursday, March 15th at 12:00 Midnight PST. With these being made to order items, there will be no “stock” of these figures available from Super 7 after they ship to fans who pre-ordered them. If you want to pick them up at their retail price, now is the time to do it. Karg: The ghoulish commander of Skeletor’s army comes armed with Crucia – The Dagger of Agony and a Fleshburner Laser Gun. Granita: The superhuman heroine of the Rock People arrives with rock pieces and her Refraction Laser at the ready. Dylamug: The evil robotic Horde Trooper comes with rotating face pieces, Cartoon-style Horde crest, firing Horde Crest, and Toy-style Horde Crest. Wraptrap: The cursed undead creature emerges from the eons with the Khopesh of Kartan and Necrobow. Mer-Man: The amphibious servant of Skeletor arrives armed with his Spear of Bakull, Sword of Rakash, and Freeze Ray Gun. Sorceress: The protector of Eternia and the secrets of Grayskull. Sorceress comes with 2 sets of interchangeable wings (one open and the other closed), an alternate head (Kaduk Ungol), and Zoar with perch. Tung Lashor: The venomous member of the Evil Horde comes equipped with a Horde Issue Jet Pack, a blaster, and an alternate head with mouth closed. Man-E-Faces: The redeemed member of the Heroic Warriors comes equipped with a Man-E-Weapons assortment. We wanted to share the latest updated sculpts for the MOTU Classics Wave 2 Figures with you. We just received these images from The Four Horsemen and we think they look amazing! As previously announced, we have extended the open time for the Wave 2 pre-order until we confirm shipping for the Wave 1 figures. We will continue to update you on the status of Wave 1 (hopefully you have seen our other emails and videos discussing the updates to the figures), and let you know when the Wave 2 pre-order will close. We are currently looking at Wave 1 to be completed around the last week of November or first week of December at the factory, and then shipping after that. Thank you again for your patience and support as we continue to build our MOTU line. Our ultimate goal is to provide the best possible (and fun!) products that we can, and hopefully you will all agree with us when you get the latest group of figures in hand. Super 7 have extended the pre-order period for their Masters of the Universe Classics Wave 2 assortments. They state that they are listening to the fans and their concerns with ordering before Wave 1 ships, so they are leaving the orders open until they do. That’s tentatively planned for end of November, so expect Wave 2 pre-orders to close some time after that. You can read their full statement below! We wanted to let all of you know that we are extending the pre-order period for Wave 2 of Club Grayskull and Collector’s Choice series figures from Super7. We have heard from many of you that you are uncomfortable ordering the next wave of figures before you get the first wave in hand, and quite honestly we can’t argue with that logic. So, to that end, we will keep the Wave 2 pre-order open until we deliver Wave 1. We figure that is only fair. We will continue to update you on the status of Wave 1 (hopefully you have seen our other emails and videos discussing the updates to the figures), and let you know when the Wave 2 pre-order will close. We are currently looking at Wave 1 to be completed around the last week of November or first week of December at the factory, and then shipping after that. 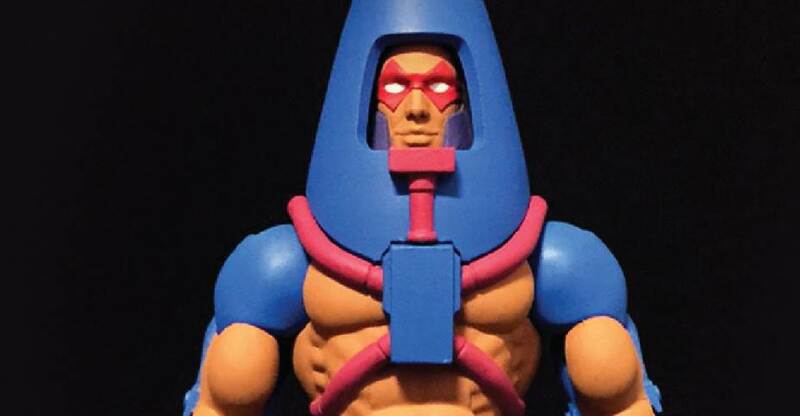 Super 7 has released details on the accessories that will be included with their newest Masters of the Universe figures. There are two assortments currently available. 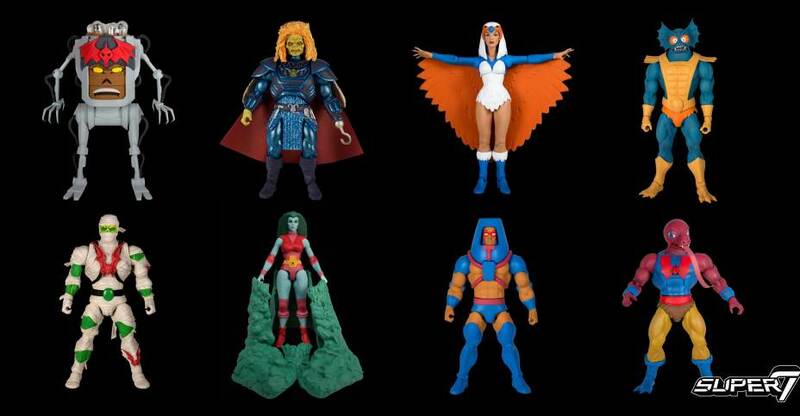 These include the next wave of Classics as well as the newest Club Grayskull (animated style) figures. They are still working on the tooling for these items, so they are not able to share photos at this time. See details on the accessories and pre-order links below. Fans can now pre-order the upcoming Masters of the Universe Classics and Club Grayskull Wave 2 Figures. The new assortments from Super 7 will be available to order throughout October, with pre-orders closing Halloween night at 11:59 PM Pacific Time. They have posted up a FAQ, which reveals that you need to order all four figures in each assortment if you would like any of them. So, if you want one of the new Classics, you have to order all of them. Same for the Club Grayskull figures. Once you’ve added one of those to your cart, you can then add as many singles of any figure in that assortment as you want. Click the links below to pre-order. Dylamug: The evil robotic Horde Trooper comes with Incineration Blast. Granita: The superhuman heroine of the Rock People arrives with her Refraction Laser at the ready. Man-E-Faces: The redeemed member of the Heroic Warriors comes equipped with an MT-83 Laser Gun. Mer Man: The amphibious servant of Skeletor arrives armed with his Spear of Bakull, Sword of Rakash, and Freeze Ray Gun. 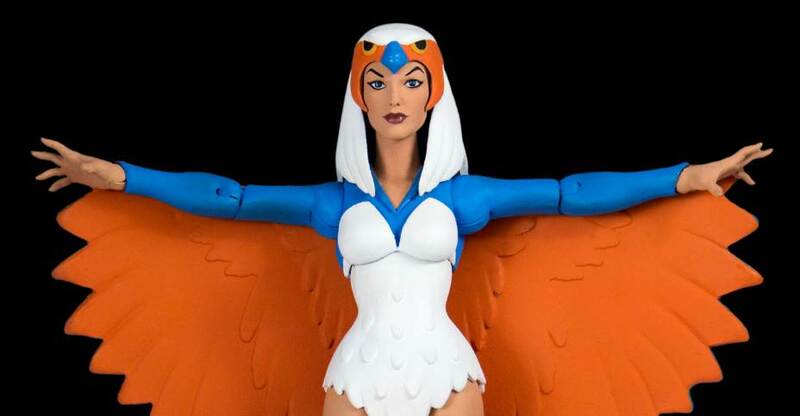 Sorceress: The powerful protector of Eternia and the secrets of Grayskull. Tung Lashor: The venomous member of the Evil Horde is equipped with a Horde Issue Jet Pack. Larger photos and some additional details have been released for the upcoming Masters of the Universe Classics and Club Grayskull Wave 2 Figures. The new assortments will be available from Super 7 starting October 2nd. They will announce further details soon. See the updated info below and the new photos after the jump. Super7 is excited to announce the next wave of the Masters of the Universe Classics and Club Grayskull figures! The line of deluxe 7-inch action figures continues with 8 new characters that have once again been sculpted by the inimitable Four Horsemen. Super 7 has sent an email out with details for their next waves of Masters of the Universe figures. 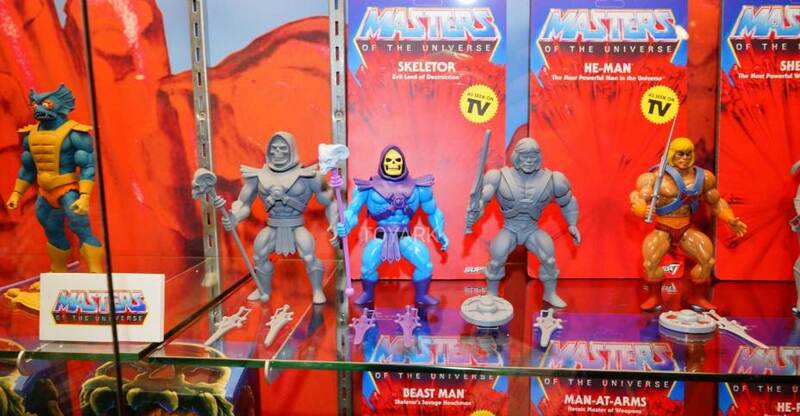 The pre-orders for the new Masters of the Universe Classics and Club Grayskull figures begin in October. Check out the details below. The MOTU Classics pre-order window will open on Monday, October 2nd at Super7Store.com. Stay tuned for details about the figures, accessories, and pre-order information.